WOODEN WOOL / YARN HOLDER. WILL HOLD A 100 Gram Ball and turns has you knit keeping your yarn tangle free. The Price is for the Holder Only and Does Not Include the Yarn. 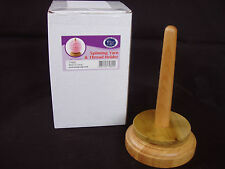 Trimits Revolving Wool Holder/Winder. Spinning Wool Winder by Trimits. Allows you to start knitting with the outside end. Allows for even tension and a smooth feed of yarn. Ideal solution for preventing balls of wool or thread getting tangled whilst in use. 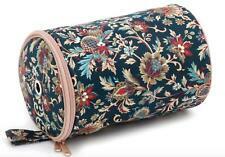 Canterbury Pattern (Floral pattern on aBlue/Green background). Yarn Holder / Yarn Ball Storage. - Keep your yarn clean and tangle free with this yarn holder. - The holder is made with lovely, high quality fabric. Our tote makes all the impossible possible! Lid slits on this yarn tote provide easy yarn access, clutter-free knitting and perfect tension. So start crocheting a sweater as a surprise for your love, friends or family with it. Cream Sewing Notions fabric. Luxury Yarn Holder. Premium Quality Yarn Holder. Hole in one end to allow yarn to feed through. Keep your yarn clean and tangle free. Suitable for most 100g balls of wool. WILL HOLD A 100 Gram Ball and turns has you knit keeping your yarn tangle free. Wooden Bamboo Yarn Bowl Holder With Lid Knitting Tool Crochet Wool Storage UK ! Wooden Bamboo Yarn Bowl Holder With Lid For Yarn Skeins Knitting Crochet. This bowl is designed to help keep yarn clean and in place while knitting, while also adding aesthetic beauty to any place that it is kept. 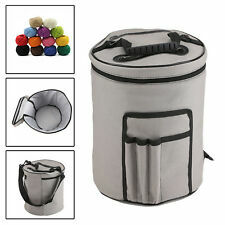 Large Knitting Yarn Storage Bag Holder Organiser With 5 balls Wool & 4 Needles . Condition is Used. Dispatched with Royal Mail 2nd Class. Mint green with needle gauge on base. Needle gauge engraved on the base. We specialise in wooden toys as well as educational and creative play. Would make an ideal gift for knitting lover! Ideal for those with delicate hands. YARN WOOL NOT INCLUDED. Perfect for preventing balls of yarn or thread getting tangled whilst in use. Approx size 10.5cm x 5cm. Hole size: 25mm (1"). Colour: Grey / White Sheep Design. Yarn Holder / Yarn Ball Storage. - Keep your yarn neat, tidy and tangle free with this lovely fabric yarn holder. - Zip top with hole to feed yarn through. - Perfect for as gift for a friend or relatively or even for yourself! Blue trim at top and bottom of holder. Zip around opening for ease of changing yarn. Stop your ball of wool rolling around and getting tangled/dirty. Eyelet opening for dispensing wool. Yarn/Wool Dispenser/Ball Holder. Flowers in shades of pinks, purple and blue. Zip around opening for ease of changing yarn. Stop your ball of wool rolling around and getting tangled/dirty. Eyelet opening for dispensing wool. Trim to match at top and bottom of holder and complete with carry handle. The yarn ball holder will keep your yarn clean and from falling on the floor while you knit or crochet. Wooden Yarn Holder. This Yarn holder will help you with your knitting or crocheting. Spins easily as you knit or crochet.